Published: Dec. 28, 2014 at 11:13 p.m.
Pittsburgh Steelers punter Brad Wing throws an interception after a fake punt in the fourth quarter against the Bengals. 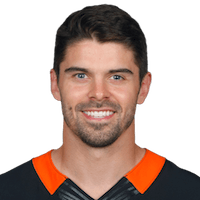 Published: Aug. 28, 2014 at 09:57 p.m.
Cincinnati Bengals punt returner Dane Sanzenbacher returns a punt 77 yards for a touchdown. Published: Aug. 7, 2014 at 11:29 p.m.
Cincinnati Bengals quarterback Jason Campbell finds wide receiver Dane Sanzenbacher as he dives at the pylon for the 26-yard touchdown.